ahhh, back from nice 'n' hot holiday in italy. Just saw our school represented on cardesignnews.com yeah!!! Well, they didnt chose the nicest pictures of my lambo, but its still very cool that our degree show finally made it on this side. didn't work a lot the last weeks, but to show something new, here are some sketches i did while tv. 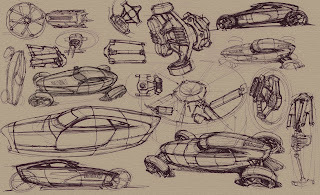 I think its time for me to design a nice hot rod finally. sadly, after 5 years of studying I never made one. But the car is almost there in my head since many years, something like the ultimate car for me. it wont be a super-modern advanced thing, cause i still like the older looking most. And I think hot rod-design takes a lot of attention on all the little parts like suspension, so do I. More to follow soon, I hope.